In this important new primer, Dustin Mulvaney makes a passionate case for the significance of solar power energy and offers a vision for a more sustainable and just solar industry for the future. The solar energy industry has grown immensely over the past several years and now provides up to a fifth of California’s power. But despite its deservedly green reputation, solar development and deployment may have social and environmental consequences, from poor factory labor standards to landscape impacts on wildlife. Using a wide variety of case studies and examples that trace the life cycle of photovoltaics, Mulvaney expertly outlines the state of the solar industry, exploring the ongoing conflicts between ecological concerns and climate mitigation strategies, current trade disputes, and the fate of toxics in solar waste products. This exceptional overview will outline the industry’s current challenges and possible futures for students in environmental studies, energy policy, environmental sociology, and other aligned fields. 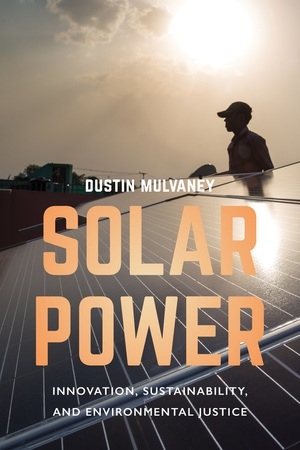 Dustin Mulvaney is Associate Professor of Environmental Studies at San José State University.